Cat collars - Choosing the right one for your pet does not have to be a chore. It is a fun and easy thing to do and you will find out how right here! Perhaps your cat would like a collar that will be a real safety feature. 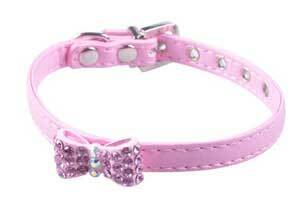 Or would they prefer you get them a glitzy personalized designer collar to match their glamorous personality? There are so many different designs these days that I thought I would show you some of my favourites. You can then decide which will benefit your cat the most! I love these shiny collars with a great coloured bell. Cats who go outside are likely to catch birds and other small animals but a bell on their collar will help to scare them off and prevent unnecessary deaths. A bell will also help you to track down your cat in the garden when they are hiding. These collars are easy to clean to with just a simple damp cloth. If you like to pamper your kitty with the finer things in life, then how about one of these elegant Rhinestone pet Collars? There are two great colours to choose from. With such eye catching designs in which are built in a strong, durable leather. It might not be advisable to let your pet go out alone in such highly desirable items. You don’t want your cat to be mugged! So it's best to keep these special designs for luxuriating in at home, or for that extra special occasion! When I first brought my cat Little Mo home, I knew that she would want to be able to go outside. My main concern was keeping her safe while she was out, so one of the first things I bought her was a safety breakaway cat collar, with a name and address tag on it. I wanted to make sure that the collar would not get caught on anything and trap her which I know can be a risk with traditional pet collars. Breakaway cat collars are designed to allow your cat to escape if it does become caught on anything, like a branch of a tree or a gatepost. 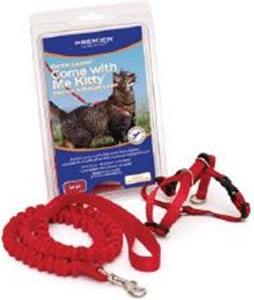 I particularly like these Kitty Breakaway collars from OnlyNaturalPetStore. The bright colours can make your kitty more highly visible and they are made from a soft and breathable material. This means they are more comfortable and kinder to your cat’s skin. Many owners use flea collars to try and control fleas and other parasites. However there are other and better options available and you can read about these on my pages all about flea control here. A lot of cats are allergic to flea collars as was my own cat Little Mo, and some can have very severe reactions so please consider this carefully before deciding. If you have an indoor cat you might like to take it out for a walk outside to explore and get some fresh air and exercise. This is a great idea, but if you do, you should always use a proper cat harness rather than attaching a leash to a normal cat collar. You can find out why on my other page here, and find harnesses that are safe and come in various sizes. I really hope you find this guide helpful to you in choosing the right cat collar and design. If you would like to see more then please visit the links on this page that in my opinion show the best range of collars I have seen!